John Lennon "(Just Like) Starting Over" RIAA Gold Record Award Presented to the Artist (Geffen GEF49604, 1980). The song was taken from his Double Fantasy LP and was the last single of new material released in his lifetime. According to the plaque beneath the gold disc, this award was "Presented to John Ono Lennon to Commemorate the Sale of More than One Million Copies of the Geffen Records Single Record '(Just Like) Starting Over'". Framed in an antique gold finish to an overall 13" x 17" and in Excellent condition. 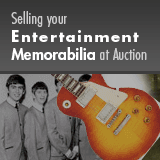 From the Connie and Dennis Dailey Monumental Beatle Collection.